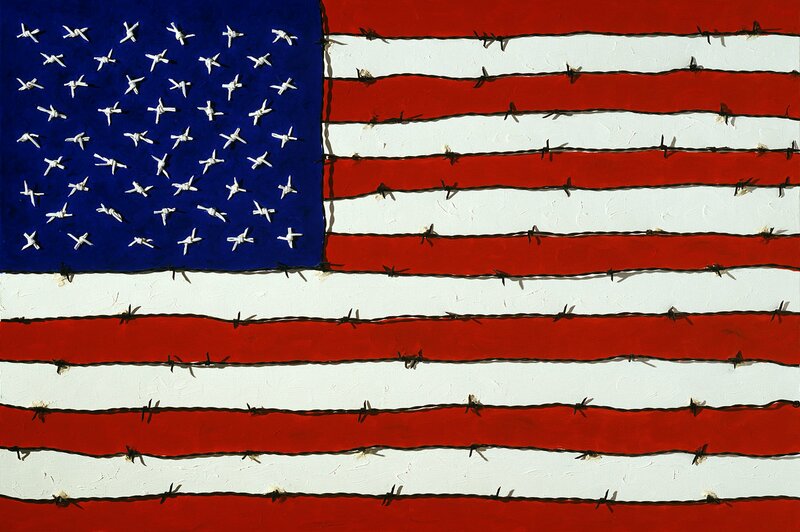 George Mullen, Sept 11 Art / 911 Art: Freedom and Tyranny, 2001, 24″ x 36″, barbwire and oil on canvas. Copyright © 2001 George Mullen. All Rights Reserved. Private collection. San Diego, California 92112 U.S.A.
America represents the great principles of freedom, equality, justice, and the inalienable rights of life, liberty and the pursuit of happiness. Although America may be the standard bearer of these principles, it unfortunately deviates from them on occasion. As we have seen with the past practices of slavery and the denial of equality to women, we must be forever vigilant against the “tyrannies” that continuously seek to undermine the “freedom” America symbolizes. Patriotism (love of country) is admirable, however blind patriotism is not. “Blind Patriotism” is the unwavering support of one’s nation regardless of whether its policies are just or not. This form of patriotism inevitably leads to tyrannical policies and regimes as exemplified by Nazi Germany, Imperial Japan and Soviet Russia. “True Patriotism”, on the other hand, is the dedication to the principles of one’s nation and a relentless determination to maintain them. We certainly must protect America against terrorists and all others who would do us harm. However, we must continuously monitor our policies and actions, domestic and international, and be prepared to change them if they do not align with our principles. If we steadfastly defend our principles, in both word and deed, the greatest days and achievements of America undoubtedly lay before us. 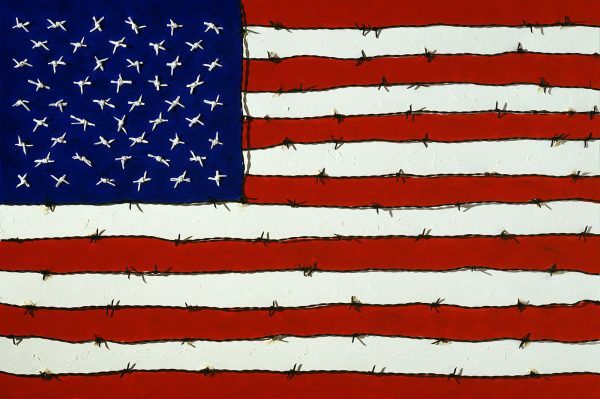 The painting Freedom and Tyranny depicts this duality of America, where the never-ending tug of war between “freedom” and “tyranny” continues.